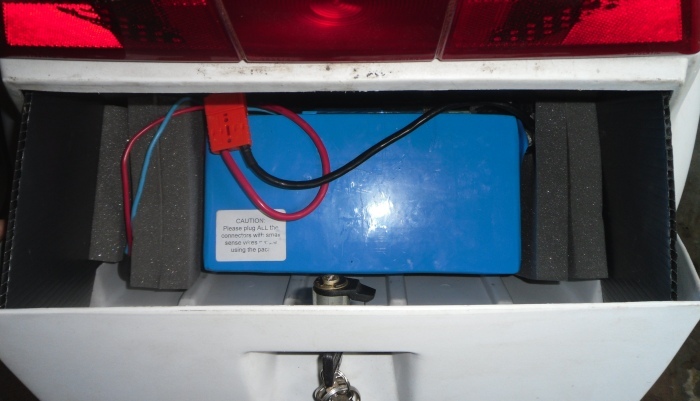 Strange question this, but has anyone ever mounted their battery in the boot? I'm curious as to how it would affect the c5 when using it with the weight in the boot rather than in the footwell, the handling/steering etc. The battery isn't particularly heavy (7.5kg), it's just long and sticks out of the footwell quite a bit. Then I could have smaller spares in the footwells or just have them empty. Hi I have no idea but you could put the battery in the boot and pedal the C5 with no battery connected up .Or if you have a smaller lighter battery you could connect it up and see how it goes (I may try it myself as I do have a very small 12v battery of a kids scooter) Will let you know how it goes ..
Where do you put your butties and thermos?